U.S. President Donald Trump will talk with North Korean leader Kim Jong-un on the phone for the first time this week, and senior U.S. and North Korean officials will start to discuss details of denuclearization. "I'm going to be actually calling North Korea," Trump told Fox News last Friday. He told reporters later, "I can now call him." At their summit in Singapore last week, Trump and Kim let White House press secretary Sarah Huckabee Sanders and Kim's younger sister, Yo-jong, into the summit room to exchange phone numbers. The White House has finished preparations and the phone call can take place as soon as a signal comes from Pyongyang, a diplomatic source in Washington said. 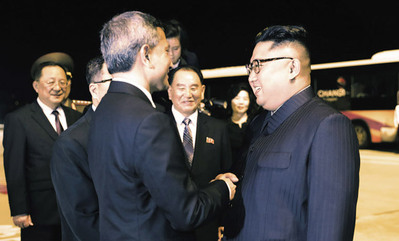 "It's huge progress that the leaders of the U.S. and North Korea now can check and confirm what they agreed in Singapore on the phone," a senior Cheong Wa Dae official said. Meanwhile U.S. Secretary of State Mike Pompeo will sit down with Ri Su-yong from the Workers Party's international affairs department or Foreign Minister Ri Yong-ho for talks as early as this week. Their goal is to discuss the early stages of denuclearization and set an overall timetable that was not included in the Trump-Kim agreement. The two sides are expected to discuss both a short-term plan for the dismantlement and shipping out of nuclear weapons and missiles and a mid-term roadmap for a complete denuclearization before Trump's term in office ends. Kyodo News reported that the U.S. has set its mind on achieving North Korea's complete denuclearization over two-and-a-half years.